High ranking British military officers and wealthy businessmen escaped the summer heat and crowded conditions by erecting handsome country estates to the north of the city. Among these was the well-to-do merchant Robert Murray who signed a 42-year lease on 23 acres of “common land” in 1764. Initially he paid $250 a year rent; and later purchased the land outright. The fabulously wealthy Phelps and Dodge families began construction of their imposing brownstone mansions on Madison Avenue, a block south of the old Murray home, in 1854. Theirs were the first dominoes to fall in what would be rapid development of the area as other handsome upper class residences soon followed. Builders Benjamin Wise, Jr. and Joseph Whitehead started construction on four speculative Italianate homes in 1860—Nos. 140 to 146 East 38th Street. Completed a year, they were three stories high over a tall English basement. The wide brownstone stoops rose to the entrance where double doors below a fanlight sat below an arched pediment supported by robust foliate brackets. No. 146 East 38th Street became home to the McCafferty family. Young Thomas McCafferty enrolled in The Free Academy in 1866, not far away at Lexington Avenue and 28th Street. The house would see a rather rapid succession of owners. By the 1870s Martin Herz, partner in Martin Herz & Co., lived here. Herz owned large factories in France and Germany that manufactured kid gloves. In 1871 he decided to eliminate the middle man by opening his own retail store at No. 761 Broadway. In 1875 Herz married Julia Ann Singer, one of the many children of Isaac Merritt Singer, founder of the Singer Sewing Machine Company. When Singer died on July 23 that same year, he left Julia 3,000 shares of Singer stock. It is possibly this handsome windfall that prompted Martin Herz to retire. He sold his share of the glove company to his partner, Ignaz Rosenberg that year. The Martin and Julia were gone from East 38th Street by 1886 when George C. Kobbe and his family lived in the house. George had graduated from Columbia College in 1874 and on February 21, 1886 he updated his class alumni on his growing family. The comfortable residence continued to see a turn-over of residents and only two years later Yale-educated lawyer Thomas Parmelee Wickes lived here. 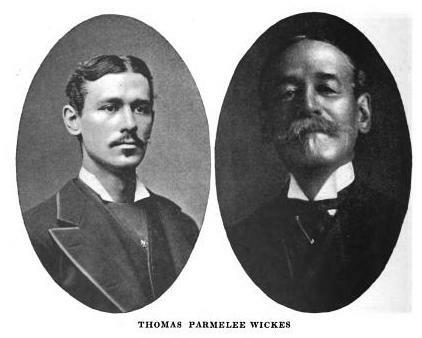 Wickes was at the time the second assistant to William C. Whitney, the counsel to the corporation of the City of New York. He and his wife, the former Harriette Douw Alley, had two children, Henry Parmelee and Marie Louise. Wickes resigned on January 1, 1890 to begin his own practice. The highly-regarded attorney would bring scandal and tarnish to his professional reputation later when his eagerness to win a case overtook his better judgment. Wickes defended Dr. Ashbel Parmalee Grinnell of the University of Vermont who had been publicly arrested in Grand Central Terminal on accusations by Commodore Edward T. Weston, of Newark, New Jersey. Grinnell sued Weston for damages; but the case was tried four times and successfully appealed. A frustrated Thomas Parmelee Wickes then turned to desperate measures. The scandal was most likely the impetus for Wickes moving to California. At the turn of the century there were only two families in the house—that of Ernest R. Adee and Thomas Curtis Clarke. Adee was Secretary of the Mercantile Trust Company at No. 120 Broadway. Highly visible in social circles, he was a member of the exclusive Union Club, the Lawyers’ Club and the Country Club of Westchester County. The family, which included the Adees’ two young daughters, summered at the fashionable Tuxedo Park resort. As was the case with other wealthy socialites, Geraldine Fitzgerald Adee was involved in charitable causes. For years she was Secretary of the Free Home for Destitute Young Girls. Thomas Curtis Clarke was perhaps the preeminent bridge building engineer in the nation. Clarke’s innovations, including using concrete on a large scale for the piers and foundations, revolutionized bridge and elevated railroad construction. In 1882 he had constructed the highest viaduct in the world—the Kinzau Viaduct—which used 1,750 tons of iron and was completed within four months without the use of scaffolding. Clarke became ill the first week of June 1901 and died in the house two weeks later, on Saturday, June 15. His funeral took place in the East 38th Street house at noon on June 17. The Adee family remained in the house through 1903. On the evening of December 13 that year the family was in their Tuxedo country house when Ernest died following an illness of several weeks. He had been promoted to Vice President of the Mercantile Trust Company earlier that year. The house returned to a single-family home when George W. Johnston and his family soon moved in. Johnston was 42-years old when the family took the house in 1904. Born in Kentucky, he embraced his roots with his membership in the New York Southern Society. He also held memberships in the Yale, University and Barracks Clubs. Johnston was president of the Johnson and Collins Company, insurance brokers, and had written several books including Why a Man Should Insure His Life, Salesmanship and Sales Arguments, and Creative Soliciting, Not Competitive. In March 1998 three ambitious men purchased the house with plans to renovate “and then cash in,” said The Observer a year later in April 12, 1999. The house was brought up to date with central air-conditioning, new bathrooms and kitchen; while preserving the architectural details—mantels, plasterwork and parquet flooring. Other brownstones along the row have had stoops removed, details shaved flat, or new facades. Their hard work paid off when the house sold in January 1999 for just under $2.7 million. The last intact home in the Wise and Whitehead row, the architectural gem survives as a relic of the days when wealthy New Yorkers were discovering Murray Hill in the months preceding the Civil War. Renovating while preserving the interior details almost unheard of these days in townhouse renovations. Looks like a time capsule and obviously by the landscaping and exterior well cared for. So much history in one house! I hope it is dealt with in a respectful manner.